EWG scientists reviewed California Baby Aloe & Arnica Soothing Spray for safety according to the methodology outlined in our Skin Deep Cosmetics Database. We assess the ingredients listed on the labels of personal care products based on data in toxicity and regulatory databases, government and health agency assessments and the open scientific literature. 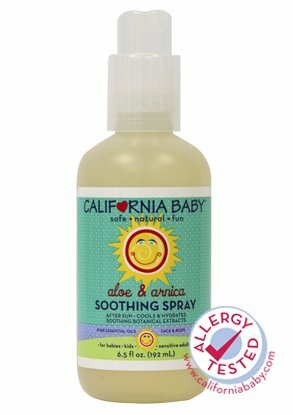 EWG's rating for California Baby Aloe & Arnica Soothing Spray is 2. Water, glycerin USP*, aloe barbadensis leaf juice (aloe vera), arnica montana (arnica) flower extract, calendula officinalis flower extract (calendula), viola tricolor extract (pansy), yucca schidigera extract (yucca), pure essential oils of lavandula angustifolia (French lavender) and salvia sclarea (clary sage), Polyglyceryl-4 Caprate**, lecithin***, allantoin, polyaminopropyl biguanide (extremely mild non-invasive preservative; less than 0.3%).